ANN ARBOR, Mich. — First, giving birth. Next, birth control. More women may have the option to get an intrauterine device or contraceptive implant immediately after delivering a baby, thanks to expanding Medicaid coverage around the country, a new University of Michigan Health System study finds. Specific Medicaid reimbursement for an IUD or implant at the same time as delivery has gone from being available in no states to 19 in just three years, according to the U-M analysis that appears in the journal Contraception. Eight other states are considering the enhanced reimbursement. Between 40-60 percent of low-income women who say they want an IUD or implant don’t make it to a follow-up office appointment to get their preferred method of birth control after having a baby, often due to childcare, transportation and other barriers. “Postpartum women have a high risk of unintended pregnancy, partly because less than 10 percent use the most effective forms of contraception,” says lead author Michelle Moniz, M.D. M.Sc., an assistant professor of obstetrics and gynecology and researcher at the University of Michigan Medical School. While many insurance providers cover permanent contraception during hospitalization for a delivery (i.e. getting fallopian tubes tied), many insurance providers have not traditionally provided specific payment for long-acting reversible methods during this hospital stay. Unintended, repeat pregnancy too close to the birth of a first baby can be dangerous for both moms and babies, with higher likelihood of adverse outcomes such as miscarriage, preterm labor, and stillbirth. Study authors conducted telephone interviews with representatives of 40 Medicaid agencies. The most common reasons agencies decided to provide coverage included perceived significant benefits for maternal and child health outcomes and overall cost-savings. Meanwhile, agencies that don’t currently provide specific payment for the service expressed concern about health risks and uncertainty about financial implications. IUDs inserted immediately after birth have a slightly higher chance of falling out than IUDs inserted 8-10 weeks later– but the risk of dangerous complications like infection or injury is exceedingly low with both immediate and delayed placement. Immediate placement of IUDs, however, is cost-effective, authors note. Contraceptive implants do not have risk of falling out, so they are a particularly attractive option for insertion during the delivery hospitalization. 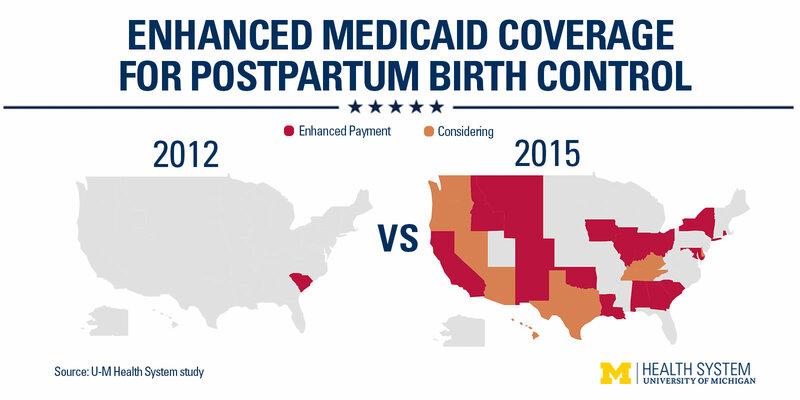 Medicaid reimbursement practices have far-reaching impact on women and families, with nearly 1.8 million Medicaid-covered deliveries in 2010. Authors hope that private insurers may follow the example set by Medicaid regarding enhanced immediate postpartum contraception coverage. “Reimbursement policies have been one barrier to providing a large group of high risk women with the safest and most effective forms of reversible birth control in a way that’s most convenient for them,” Moniz says. Additional Authors: Vanessa Dalton, M.D., M.P.H. ; Matthew M. Davis, M.D. M.A.P.P. ; Jane Forman, Sc,D. ; Bradley Iott, M.P.H. ; Jessica Landgraf, M.A. ; Tammy Chang, M.D., M.P.H., M.S., all of U-M.
Reference: “Characterization of Medicaid Policy for Immediate Postpartum Contraception,” Oct.6, 2015, Contraception.